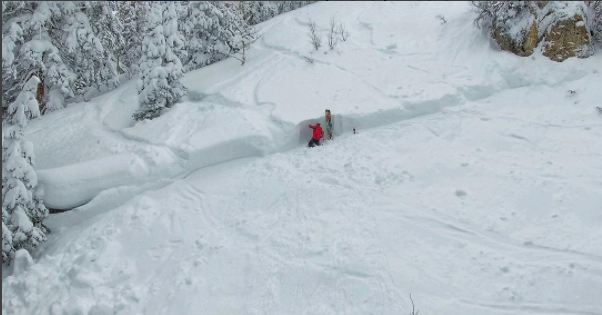 Two snowboarders were rescued late Wednesday night after becoming buried and seriously injured in an avalanche on a backcountry slope near the Smith and Morehouse Reservoir in the Uinta-Wasatch-Cache National Forest. The two men, who are in their 40s and from the Salt Lake Valley, were with a group of 11 near Mud Lake Flats, said Lt. Andrew Wright, with the Summit County Sheriffs Office. He said the avalanche occurred at around 4 p.m. when one of the boarders jumped off a cliff, fracturing a large slab of snow. “We weren’t notified until around 8:15 p.m. when people that were involved with the party finally made it down to Oakley where they had cell phone service,” Wright said. The group was unable to contact law enforcement officials immediately after the avalanche because of limited phone service, Wright said. Three members of the group took a snowcat out of the area to reach their vehicles, but it broke down on the way. They were eventually able to hike down to Oakley to notify authorities of the situation. The slide carried one of the men, slamming him into trees on the way down, Wright said. He reportedly broke both of his legs and was airlifted by a medical helicopter to a Salt Lake-area hospital. The other man was trapped under several feet of snow for up to eight minutes, Wright said. Wright said one of the snowboarders told search and rescue he though they might trigger an avalanche, but didn’t think it would as big as it was. Craig Gordon, a forecaster with the Utah Avalanche Center, said avalanche danger in the Uinta and Wasatch Mountains remains high in certain backcountry areas, meaning human-triggered slides are likely. He said other zones are experiencing considerable danger as storms continue to drop light, fluffy now on top of already dense snow. Gordon said conditions will start trending toward a more stable snowpack. “Avalanche conditions are constantly changing,” Gordon said, adding if people plan on heading out into the backcountry they should be armed with the latest advisory for their zone. For up-to-date information about avalanche conditions in Utahs northern mountains, go to https://utahavalanchecenter.org.